There is something about diamonds that makes men lose their minds. ABOVE: Raw diamond from Oranjemund, Namibia. Getty Images, Anthony Bannister. In February of 1872, two scruffy prospectors arrived in San Francisco with a pouch full of hundreds of uncut diamonds, rubies, sapphires, and emeralds. They soon had the attention of the richest and most powerful men in the city, including William C. Ralston, president of the Bank of California. The miners spun a tale about a fabulous gem mine, a mountain of wealth so rich that stones could be casually kicked out of the ground. They revealed everything–except the mine location, letting potential investors think it was in Arizona. The rich men talked the gullible miners into selling them three-quarters of the claim. But, no fools, these shrewd businessmen wanted to be sure the mine really existed. The miners agreed to take them to the site, but the partners had to travel blindfolded. They rode for four days along a winding path, finally stopping at a small mesa with an elevation of about 7000 feet. Their trip was worthwhile. They found a 108-carat diamond, later valued by a San Francisco jeweler at $96,000. They returned to San Francisco jubilant. Still, the partners and a growing crowd of backers insisted on an unimpeachable valuation of the stones. Off they went to New York, where Charles Tiffany himself pronounced the stones “beyond question precious stones of enormous value.” The sample was only a tenth of the stones being held in San Francisco, but Tiffany valued them at about $150,000. The partners were delirious. Finally, the consortium asked Henry Janin, the most well-known mining engineer in the United States, to examine the claim. Janin, they said, was impossible to fool. In examining more than 600 mines, he’d never made a mistake in a value. He agreed to examine the site–for a stiff fee and the option to purchase 1,000 shares in the new company. Again, they all traipsed to the mine and Janin pronounced it well worth the investment. One of the miners stayed behind at the mine. He never appeared to claim his share of the payment. His partner claimed both shares–$600,000–and left San Francisco. Clarence King. Taken in 1869, about the time of the western survey that made him sure the diamond offer was a hoax. US Department of the Interior, Geological Survey. King had led a six-year survey detailing the resources of the territory crossed by the transcontinental Union Pacific Railroad. 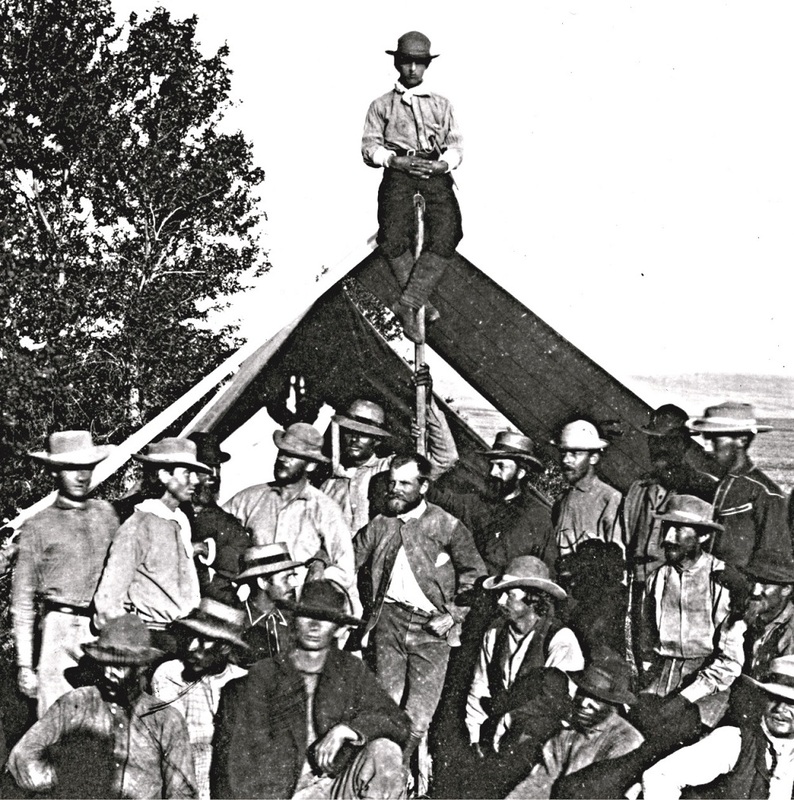 The 35-man expedition studied rock formations, mountains and valleys; examined mines and mineral deposits; made topographical maps; studied weather; and gathered specimens of plant and animal life in an area 100 miles wide and 800 miles long along the 40th parallel. 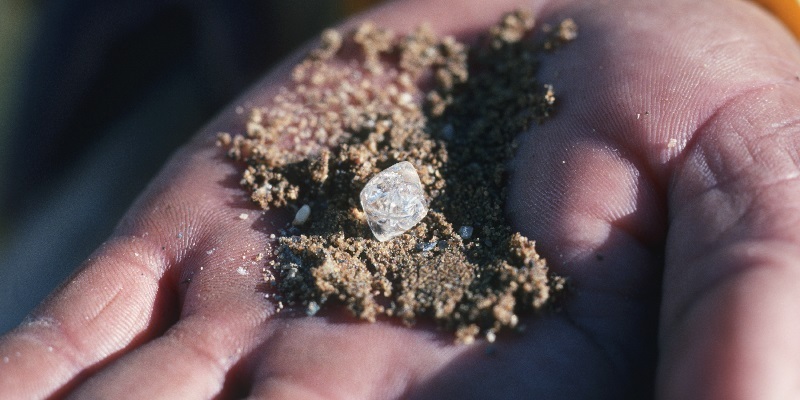 When King and his colleagues heard stories of the diamond field, they realized the alleged deposit had to be within the area of their expedition. Yet they had found no evidence of gem deposits–certainly not one so unusual it would contain rubies, emeralds, sapphires, garnets, and diamonds. It was vital to King’s career and the credibility of his survey that he determine whether or not the mine was a fraud. Part of the team that made the survey of the 40th parallel in 1867. King is in the center in front of the tent pole. After questioning Janin about the ride to the mine and the weather, King and a colleague realized they knew just where the mine had to be. Under the guise of doing more survey work, they set out to find it. Find it they did. 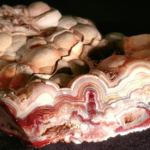 One geologist almost immediately found a ruby. That night they were all believers. The next day, however, they became cool professionals. The geologists discovered that anthills had been drilled with sticks or rods, and stones sprinkled into the hole. They dug pits to the bedrock, knowing that diamond’s high specific gravity should have caused the stones to sink, over time, through the sand. They found nothing. King immediately returned to San Francisco and alerted the partners. At first, they didn’t want to believe him. But the geologist’s knowledge of the terrain and his minute description of his findings left no doubt that the “mine” had been salted. Eventually it was discovered that the miners had made two trips to Amsterdam and London, visiting cutting houses and buying all the poor-quality rough diamonds and other gems they could at a cost of $25,000 to $50,000, money that supposedly came from the sale of a couple of gold mines. The miner with the $600,000 went to Kentucky and opened a bank. When the victims of the fraud came after him, the state of Kentucky refused to extradite him to California, although he eventually turned over $150,000 in exchange for immunity from prosecution. He was shot and killed about a year later by a competing bank owner. Ralston, the owner of the Bank of California, was left holding the bag. 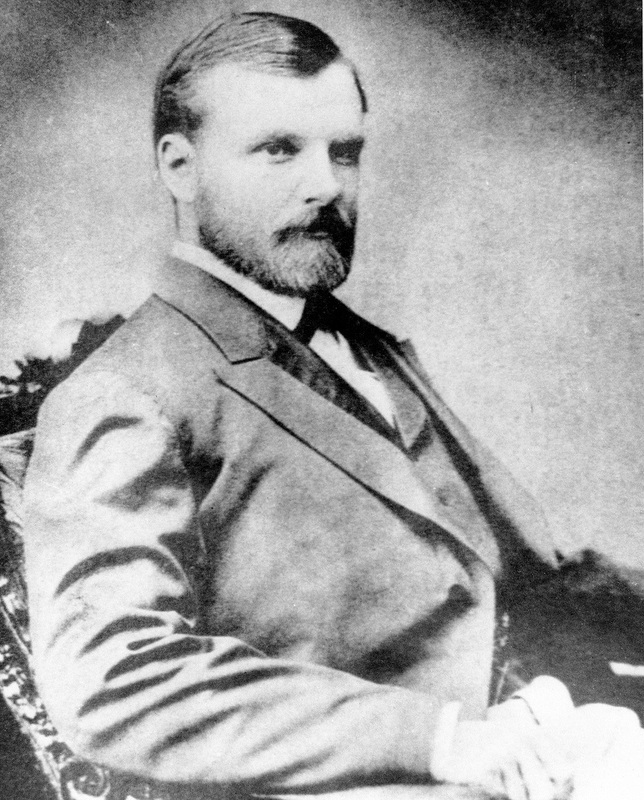 He paid all the investors back, but three years later, the Bank of California became insolvent. Shortly thereafter, Ralston was found floating in the San Francisco Bay. It was alleged that he committed suicide. Sharon Elaine Thompson is a GG and FGA who has been writing about gemstones and jewelry for Lapidary Journal Jewelry Artist since 1987. She also writes a line of birthstone romance novels under the name Liz Hartley. Get Lapidary Journal Jewelry Artist and other gemstone resources today in our shop!